The death of the Cadillac CTS wagon marks the death of the wagon at General Motors in America – or does it? Motor Trend has a few ideas that can help GM plug its gaping wagon hole in the U.S.
Buick Regal Country Tourer: Using the Opel Insignia Country Tourer as a base, MT argues that GM should slap some Buick badges on this off-road ready wagon and send it stateside. While it’s not exactly the enthusiasts choice, we can’t argue with the idea. It would be seemingly cheap and easy for GM to accomplish, and will likely rack in sales for the brand (if the success of the Subaru Outback is anything to go by). Cadillac ATS Shooting Brake: Surprisingly MT is arguing for a five-door ATS wagon with the name “Shooting Brake.” Semantics aside, an ATS wagon would make a solid replacement for the now-defunct CTS wagon. Unfortunately, even MT acknowledges the likelihood of such a model is right around 10 percent. Chevrolet Cruze Wagon: Like the Regal Country Tourer, a Cruze wagon should be relatively easy for the brand to bring stateside as the model is already sold in other parts of the world. Unfortunately, with the upcoming release of the new D2XX-based Cruze, we don’t expect a Cruze wagon to be offered to U.S. customers anytime soon (if ever). GMC All-Terrain Wagoneer: Count this one as a pipe dream. MT is advocating for a “chopped and lifted off-roading monster” based off of the Terrain SUV. Aimed at the Subaru Outback, we don’t see an “All-Terrain Wagoneer” ever becoming more than a mere concept. GM used to own part of Subaru, but they couldn’t figure out how to co-design a vehicle so they sold the stake and now Toyota part owns it. Holden Commodore SS-V Redline Sportwagon as the Chevrolet SS Tourer? Holden Commodore Calais-V sedan & Sportwagon as Buick Calais? Does GM really need a wagon in the US? Last time I checked, crossovers reign supreme, for the European market, however, this is a necessity. Wagons don’t sell here. Take a look at the prices of late model (Non V series) CTS wagons? They are generally several thousand in back of the equivalent sedan. The CUV craze has virtually eliminated the need for wagons here, not that there were many sales to begin with. What GM continues to ignore is the affordable performance car. Besides the Camaro, they have zero vehicles in the $25-30K range for the performance enthusiast. It shouldn’t be a Cadillac…….maybe a Malibu….there’s lots of extra production capacity there and it’s probably in the rice price point……..maybe bring back the Nomad? I love how people on the web keep crying for wagons yet they all fail in a few years here in the states. I like wagons but the reality is the market does not unless it looks like a truck or SUV. The CUV market is not just getting larger it is rocketing through the roof right now. People here like them as they are part minivan and part SUV. The taller roofs give them more usable space and they sit higher like many people like to drive. The only way I can see a wagon making it here is if it is a model Cadillac builds to sell in Europe and keeps a few here to sell in the home market. With no Europe it will fail again. The reality is the American market is not Europe and there are differences here that need to be accounted for. Case in point Europe love a Opel wagon. But in the states GM could hardly give away a Cavalier wagon. So in the Cobalt they do a truck like HHR and it sells in six figures. If you tried to sell the HHR in Europe they would think you were nuts. While we can share many vehicles there are some market specific cars we need to keep in each market. I love my turbo HHR but right now there is nothing to replace it. I may go back to a GMC just because there is no wagon with any real performance left. I may own a HHR but I bought it for the performance. I could care less about the retro truck looks. I wanted something that hauled in two ways. Speed and cargo. The reason it needs to be a Cadillac is when you sell less than 20,000 units you need to make up the profits on price since you have no volume. I personally disagree completely. The reason the CTS Wagon wasn’t selling in large numbers was because it wasn’t affordable to the average Joe. I do believe that Cadillac should really consider an ATS Convertible and a CTS Wagon. That way, it leaves room for a Regal Wagon. Also, Chevrolet should get a Cruze Wagon while Buick get’s the Verano Hatch. You have a right to be wrong. 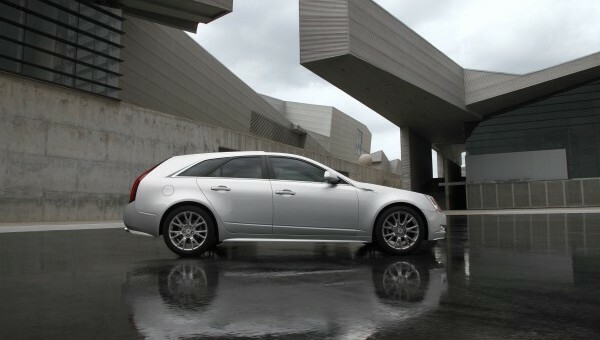 Price is not what killed the CTS wagon the lack of it going to Europe where it would be appreciated is what killed it. Show me another true traditional wagon that does not try to mimics a truck or SUV that sells at a cheaper price that lasted more then a few years. The Magnum failed and the Subaru mimic’s a off roader SUV like from as does many other cheaper wagons. The only ones that sell in small numbers is a VW wagon that is the market oddity as it sells because it is German and it is a VW that has a cult like following. If it were not sold in Europe we would never see one here. Times have changed and the markets have changed and today a traditional family wagon is seen much like a Family trickster in vacation. If you think you hate it now just wait till you drive it. If you are going to take a risk on anything close to this you need a 5 door hatch for the Verano or Cruze. Either of these are the only real chance of sales in this country. But even now the more the CUV movement takes over the greater struggle they will see in the future. Trust me if there was money to be made in this segment they would have several models. The entire industry is not passing it by just to spite wagon lovers. If the Buick regal is already ratified stateside, like it has been for many years, then why does bringing the insignia wagon vairiant to the states create a volume issue, since it technically already exists. It would seem a great way to plug these low volume niche product holes would be to leverage G.Ms global offerings over a greater geographical footprint. As time moves on and chassis/drive train commonalities increase, we may see much more of this. VAG Group is acting crazy and trying to sell all of its products to the maximum. In Europe, VW-AUDI-SEAT-SKODA, and these stamps are the same for all models. GM should act in a way to sell as much as possible, and no matter where it produces money and you can develop things get better. VAG Group is brilliant just the way things are done there. ok now it seems that GM has begun to act in the same way as the VAG. But GM should be more aggressive. Europe, U.S. to offer decent cars, and all the models BUICK U.S. market under the name, and also in China, and many more options. U.S. market Audi S3, RS3 VW Golf GTI, r.
and why the Regal GS is not like the insignia opc. definitely sell more. Now do not buy GM products to be purchased VAG product in America. it’s just an example. U.S. market GM and FIAT 500 e isaa anything. Why did not Adam Opel U.S. MARKET. I just do not understand parts of the things that seem so simple, however, as GM would not want to earn money. Audi A1 is the U.S. market? What the hell is wrong with these people ??? Are they so blind that they cannot see this ??? GM needs to be as many markets as possible and sell as many of their products as possible. any of these products do not bear the name. GM unites them. and all of the money is only for the benefit of GM. GM needs to be very aggressive. VAG is doing a fantastic job, and cooperation among the various car manufacturers. All VAG manufacturers to develop and share these things, and this is to look at the positive, and they earn big money and grow. GM must work together and be more aggressive and to sell the land for all its different products in different markets all. insignia 4 door, 5door, sportourer,crosstourer, opc models. This is all the money GM. definitely some VAG models instead purchased them buick models. and this is the value for GM.